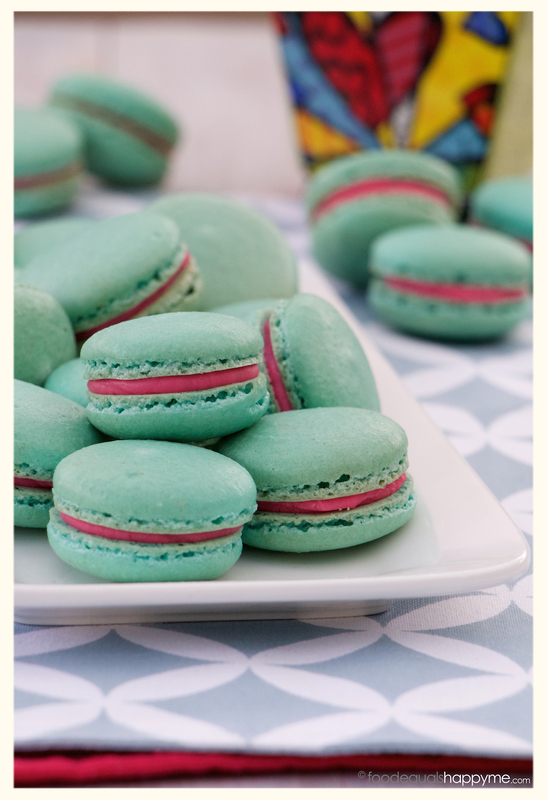 My love affair with the gorgeous macaron continues on strong with these Bubblegum Macarons, and I have to say, I think these might just be my new favourite! If you want a flavour that will take you straight back to being a kid, then it has to be bubblegum. When I was a kid anything bubblegum flavoured was awesome (btw anyone remember that bubblegum tape that you used to get as well?). 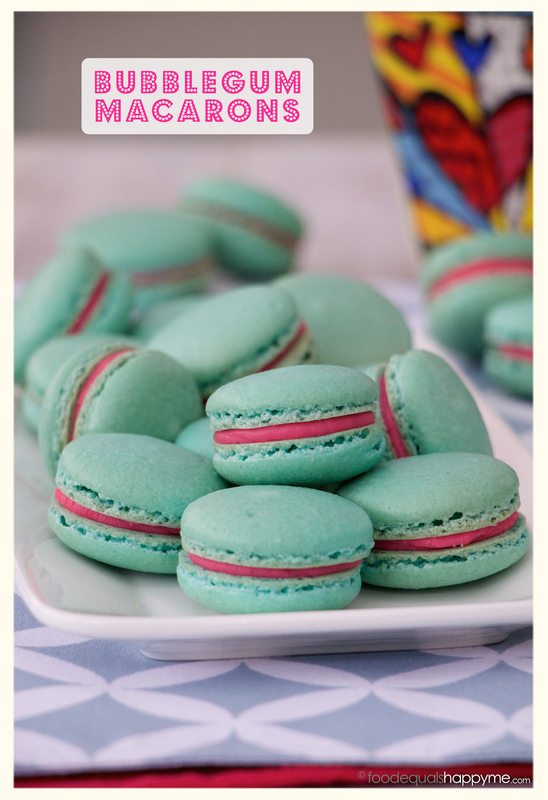 These bubblegum macarons are everything you want them to be – bright, fun and oh so yummy. They will certainly put a smile on anyone’s face, young or old. 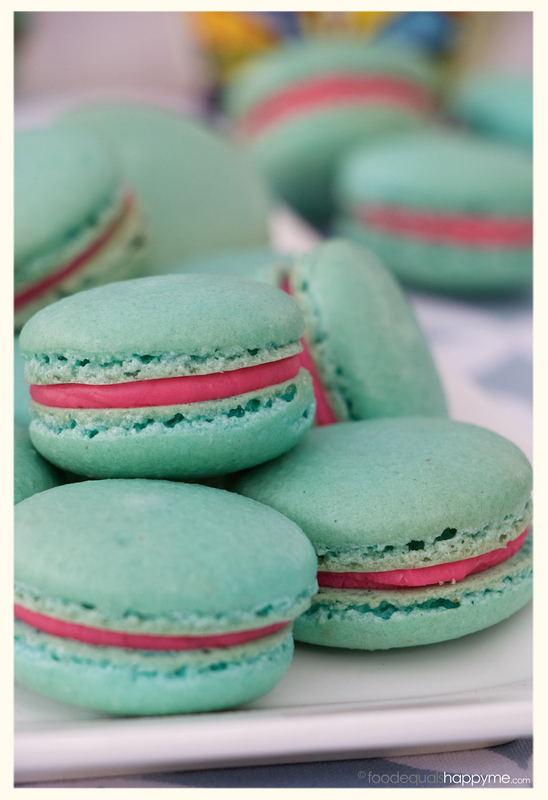 I’ve done a few macaron recipes on the blog already, so if you’re new to them and looking for a few tips & tricks, then check out this post here before giving these a go, because they are well worth it! First prepare the bubblegum ganache filling. Place the chocolate in a bowl, then heat the cream in a saucepan over a medium heat. When the cream just comes to a boil pour it over the chocolate and leave to sit for 1min before stirring until smooth. If you find the chocolate doesn’t completely melt then place the bowl over a pot of simmering water and continue to stir until it is completely melted. Add the pink chocolate suitable food colouring and a few drops of the bubblegum essence then stir through. Taste the ganache to check if you are happy with the amount of bubblegum flavour, and if necessary add a little more until you are happy with it (be careful to only add a few drops at a time as it can be strong). Cover the ganache and set it aside to cool until it reaches a piping consistency. If you find it is not firming up enough then you can pop it in the fridge briefly to firm, just check it every 10mins. To make the macaron shells, put the icing sugar and almond meal in a food processor and pulse briefly (don’t overdo it as if you do you will release the oils from the almond meal) then sieve it into a bowl discarding any large pieces that are left behind. Whip the egg whites in a large metal bowl until soft peaks start to form (about 1-2mins) then slowly add in the caster sugar a spoonful at a time and continue to whip until stiff peaks form. Add the teal food colouring and mix for a further 1min to incorporate. Next add half the icing sugar and almond meal mixture to the egg whites and fold through. Add the remaining icing sugar and almond meal and continue to mix through until fully incorporated. You don’t need to be too gentle as you actually want to knock out some of the air. Keep mixing until it reaches a nice drop consistency, that all but falls back into itself. Place the mixture in a piping back with a large round tip and pipe into 4cm rounds on trays lined with baking paper. Ever so slightly tap the trays to get out any air bubbles. 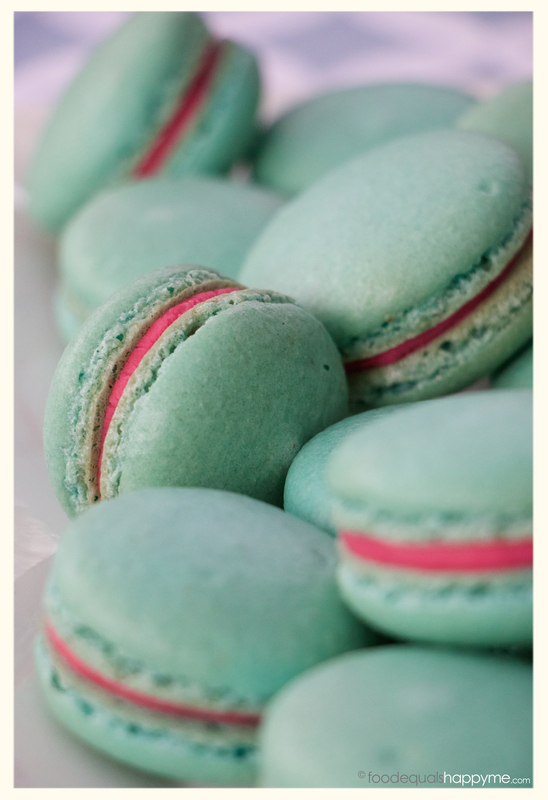 Leave the macarons out at room temperature for 30-45mins to form a skin on the top. The skin is what creates the ‘foot’ of the macaron whilst cooking so this is a very important step. When the skin has formed, you should be able to see a change in the look of the surface of the macaron, and it shouldn’t be sticky to touch. Cook the macarons in a preheated oven at 130 degrees celcius for 17-18mins. You can tell they are done if the macaron can be lifted off the baking paper easily and the base isn’t sticky. Remove from trays and leave to cool. Pair up the macaron shells in matching halves, and pipe the bubblegum ganache onto half the shells. Sandwich together pushing the filling just to the edges of the macaron. Pop the macarons in the fridge to set for a few hours, or preferably overnight. 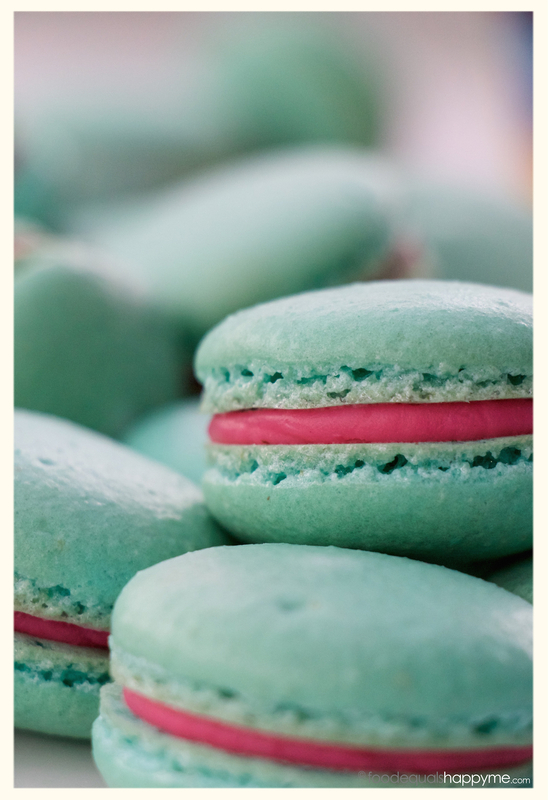 Take the macarons out of the fridge and allow them to come up to room temperature before serving.